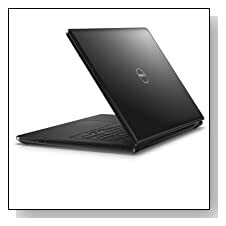 Dell Inspiron i5758-1428BLK is a new well-built 17.3 inch large screen desktop replacement laptop as part of the 17 5000 Series. It comes with the dual core Intel Core i3 5005U processor (3MB cache) at 2 GHz speed without turbo boost but hyper threading (2 cores and 4 threads for better utilisation of the CPU), 4 GB Single Channel DDR3L SDRAM memory for sufficient multitasking power, 500 GB Serial ATA hard drive at 5400rpm spindle speed and 64-bit Windows 8.1 operating system with a free Windows 10 upgrade as it’s become available on Windows website at the end of July 2015. It can handle all your daily tasks at home or office as well as the more demanding stuff with the Passmark benchmark score for this Broadwell processor just under 3000 at the moment. 17.3 Inch HD+ Truelife LED-Backlit non-touch widescreen large display with True Color that allows you to adjust color saturation and temperature to your liking with rich and vibrant colours and a 1600x900 pixel maximum screen resolution (is not Full HD if you’re used to sharpness and crispness of FHD) and Intel HD Graphics 5500 with shared memory. It is nice to have a more spacious screen to work on multiple tasks more comfortably. Waves MaxxAudio and stereo speakers offer studio quality sound with higher highs and lower lows when you’re listening to music or streaming videos. It has a decent 720p webcam with an integrated microphone so you can chat live with people. Full backlit keyboard with nicely spaced out keys and 10-key numeric pad for easier number crunching and large precision touchpad without the dedicated left and right buttons that lets you scroll, point and zoom and you’ll be able to type accurately and comfortably even in the dark. You can’t expect much in terms of gaming performance as it doesn’t come with a dedicated GPU but you’ll be able to play the older titles fluently. Dell Inspiron looks good with a sleek and modern design and shiny black exterior (but still looks like an Inspiron) which can also be prone to easy finger prints, it weighs 7.4 pounds and has the measurements of 11.15 x 16.41 x 1.15 inches- neither slim nor lightweight and not so portable with its 17 inch screen and should be considered more as a desktop replacement machine that you can move around the house rather than taking it out and about. With a TDP- Thermal Design Power of 15 watts, the 4-cell 40 WHr lithium ion battery gives you up to real 6 hours on a single charge in light to average use so you can go longer between charges if you’re away from power outlets. Connectivity options include 802.11 A/C for faster internet connection with larger coverage- less buffering, better streaming with coverage throughout your house, Bluetooth 4.0 tied to WiFi card (Dual Band 2.4&5 GHz, 1x1), 1 x USB 3.0 port, 2 x USB 2.0 ports, Tray Load DVD Optical Drive that reads and writes to DVD/CD, 3-in-1 Media Card Reader, Biometrics FastAccess Facial Recognition for gaining safe access to the system (free for the first 30 days) and an HDMI output. Conclusion: Dell Inspiron i5758-1428BLK is very easy to set up and use with everything running smoothly unless you’re working on very complex software or running the latest advanced games at higher settings. 1600x900 HD+ resolution is the minimum a 17.3 inch display should have but it looks good on this computer. Windows 10 has new features like faster start ups (in under 15 seconds), Cortona- personal digital secretary, expanded Windows 7 Start Menu, Continuum and the brand new Microsoft Edge browser. 4GB RAM is adequate for your daily multitasking and if you’re intending to upgrade, it is offered on a single channel 4GB x 1. You get 30 day trial versions of McAfee CB LiveSafe and Microsoft Office (not much junkware that you need to remove and if you experience slow start-up, first remove McAfee) and includes a 1 year Mail-In warranty if anything goes wrong within this period or if you need assistance as Dell offers great customer and technical support. This one doesn’t have a touchscreen but will you really be using it much, especially on a large display? Build quality is great for a budget priced laptop and is not particularly light but it is a bit hard for a 17 inch machine to be lightweight: You need to consider weight vs large screen, whichever is more important to you. 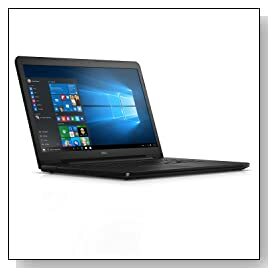 This is a good basic laptop with modern features, good speakers and nice image quality for home entertainment, school or work (there is not a specific target group but we’d say light and mid-range users) at a low price.